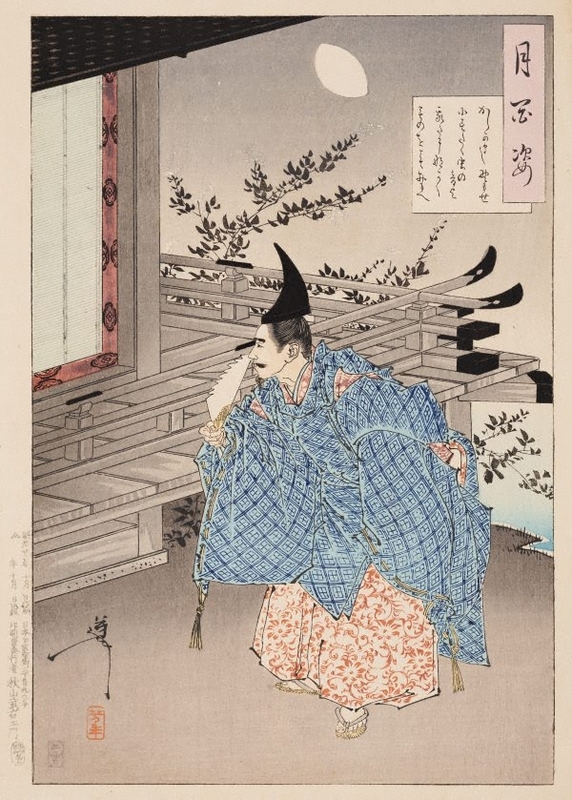 The courtier Tairo no Tadanori was an accomplished poet and warrior. On a moonlit night, he is shown waiting outside the house of his mistress Kiku no Mae. Much to his annoyance, she is inside with a lady visitor. After waiting for a long period, he loudly flicks his fan open and closed to get her attention. She indicates that she knows he is there by telling her visitor, ‘Listen to the sound of insects calling in the field.’ He eventually leaves, disappointed; she, also saddened, sends him a love poem and kimono the next day.